Great Functional defensive tool. I have bought several as gifts to friends who are reside in tough neighborhoods. They feel safe in possession of this and I feel safe they have a means to defend them self. Amazing product. I was skeptical about the quality of the brush or the dagger. but both are amazing quality. the price is impossible to beat. shipping is lighting fast. definitely worth the money. i have my gf carry it to work and it has already scared away a mugger. Worth every penny!!! I'm really happy with this. The brush head itself is excellent quality, and the dagger is just enough to protect yourself without feeling like you're concealing something that could get you in trouble. Dagger also doubles as a superb brush cleaning tool. After this I don't see why someone would get just a normal hairbrush. Exactly as the description states! This hidden dagger is well worth the cost. I bought this for my sister, as a second mean of self defense (first is her pepper spray). Now my mind can remain at ease while my sister is off living her life. Thank you True Swords and Cold Steel! I bought 5 items, including this knife for my first order. Everything is perfect and super fast shipping. Customer service, we responded to my email on a Friday evening 11h! It's incredible! And on Tuesday, my package arrived! So, this comb is great, perfect. It is very well adjusted. The dagger can not go out alone, or by a routine check ... You know what I think?! And surely a very dangerous weapon too. Perfect size and cap my hair! Everyone should have it in her purse, her car ... everywhere! because the price is good too! This item is ideal for an urban setting. The brush works very nicely and the dagger provides an excellent "last ditch" self defence tool for unanticipated circumstances. Like the other reviewer, I bought this for my girlfriend. It's well constructed and would be an effective dagger. The brush works as a brush should. It will certainly pass a purse check if you are taking it inside a club where they do that sort of thing. I only gave it 4 stars because trueswords sells a pepper spray pen for the same price. I also bought my girlfriend (and most of her friends) the pepper spray pen. Everyone is much happier carrying the pepper spray than a dagger. Most are unwilling to use a dagger, while they'd have little hesitation to use pepper spray. 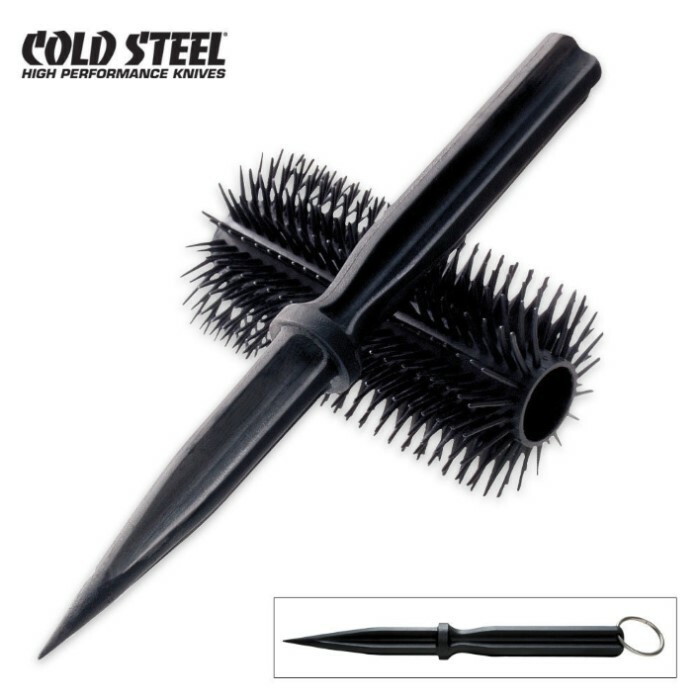 If you want a discreet weapon, this comb will do nicely. If you want a weapon that you won't be afraid to use, opt for the pepper spray. Or, do what I did, and get both. Got this for my girlfriend and surprisingly she loved it! Brush is actually good and the dagger will pierce anything with force.